What is the Sacred Chalice? How can you forge yours? 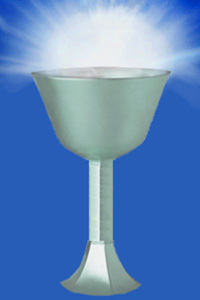 The Sacred Chalice is the physical container into which the Divine can enter and be held. In other words, it is a channel for Divine Energy and Consciousness. And you are this channel. It is your body and your mind which need to be able to contain this Energy. Preparing your body and mind to physically handle this increased flow of energy is the purpose of all spiritual practice. And it's the process of spiritual enlightenment. Every spiritual path is a practice of developing your strength and flexibility. This is the process of Forging the Sacred Chalice. Some spiritual paths are more comprehensive in their development than others. Some focus more on the mind, and others more on the body. The best ones develop all of them. This is why yoga - traditional yoga, not the Western version - has produced so many saints and sages. It simultaneously develops all these aspects of the Sacred Chalice. It's no coincidence that so many Witches also practice yoga or some form of Buddhist meditation (or bellydance!). These are also very effective at forging the Sacred Chalice. Each spiritual path has a unique way of forging the Sacred Chalice. But every spiritual path teaches the techniques you need to forge this Sacred Chalice. Forging the Silver Chalice is training yourself to be more available to the Divine. Being a channel of the Divine is more than just deciding you want to be. When you desire to become more transparent to the Divine, you must prepare yourself physically, mentally, and emotionally. Ordinarily, human beings conduct a certain level of energy, at certain frequencies. The frequency of Divine Energy is much greater than a person can safely contain. Unless they are properly prepared. Spiritual practice enables you to carry these higher frequencies safely. Another way of looking at this is you are preparing yourself for spiritual enlightenment. And you are this Chalice. At least in raw form. The Divine already lives in you. You could no more be separated from Her than a drop of water is separate from the ocean. The expression of Divinity within you is . . . Consciousness! Without the Divine Within you, your heart would not beat, your brain would not spark . . . you would have no consciousness nor life. You would be inert soil. You'd still be made of the Source - because everything must be. But you wouldn't be alive, not as we know life. So You Want To Be A Chalice . . . So if you are already the Chalice, what is there to forge? Well, there are chalices, and then there are Sacred Chalices. For instance . . .
You can pour wine onto a rock, but it won't cup it. You can pour wine into a leaky cup, but that wouldn't do much good either. You can pour wine into the mouldy compost bucket, but what's the point? It won't be any good. You can pour wine in a paper napkin, but the napkin will be the worse for it, and again the wine will spill away. The purpose of Forging is to create a Sacred Chalice that's up to the task. You must make yourself ready for these increased Energy levels, and expanded awareness. Otherwise, one of four things will happen . . . It will fry your synapses. To find out what kind of Chalice you are, click here. This can result in serious damage to the body or the mind, leading to decades of illness, psychological collapse, or even death. That is why forging the Sacred Chalice is important! These are not games. Spiritual enlightenment is not just a nice concept. It's real, and the Energies it channels are real. If you aren't ready for them, you either can't connect with the Divine, or you are in for a whole lot of suffering if you do. So if you are interested in spiritual development, Forging the Sacred Chalice is of prime importance. Like a vessel to hold wine, a Sacred Chalice must be . . .
Once you have made yourself into a container for the Divine, capable of being a Channel of the Divine, there is one more step. The Silver Chalice transmutes into Crystal. There is nothing you can do to transform yourself into a Crystal Chalice. Your work is to forge the Silver Chalice. Once you do that, and the Divine begins to fill and overflow you, you will gradually become more and more clear to that Light. At some point, a critical mass is reached, and you experience an awakening. This will be temporary, but it will change you. You become less attached to the idea of your self, and more attached to the Divine. Over time, these experiences return, and increase. Gradually - usually - your ego's grip on you is relaxed. As your ego diminishes, you begin to exist for your spiritual Essence. You become a clear vessel for Divine Energy - a Crystal Chalice. This happens through the Grace of the Divine, rather than directly through your own efforts. Your part is to find spiritual practice that works for you, and keep at it. This helps you develop the qualities which will allow you to be a Sacred Chalice . . .
You can develop your Sacred Chalice through various spiritual practices. But if your heart is Wiccan, then you'll want to practice Wicca Spirituality. The old Wicca - Wicca the religion - was not designed as a spiritual practice. It has mystical leanings, but if you really want more connection with the Divine, it can only take you so far. There is much more potential in Wicca, though. And what is required is not so much a change of practices, as a shift in perspectives. When you practice Wicca with the intention of developing your Sacred Chalice, you will find yourself becoming more open to the Divine. This also means, of course, accessing more Divine Power in your life. Which means more effective magick, more joy, and increased health and energy in your daily life. Spiritual Practices & Power Tools Spiritual practices bring you to conscious awareness of the Divine within and around you. They are power tools to prepare yourself as a conduit for the Divine forces that every Witch calls upon . . .
Introduction to Grounding Technique No matter what kind of work you're doing, proper grounding will prepare you for it well. . .